Human Combat Chess played by standard chess rules. 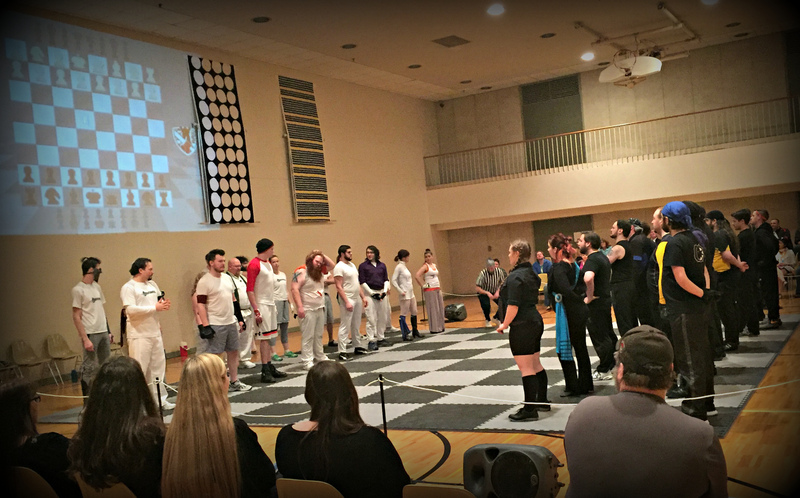 I did not know what to expect when I walked into the “arena” for opening night of the Midwest Combat Chess League (MCCL) Human Combat Chess All-Star Series, produced by Six Elements Theatre. 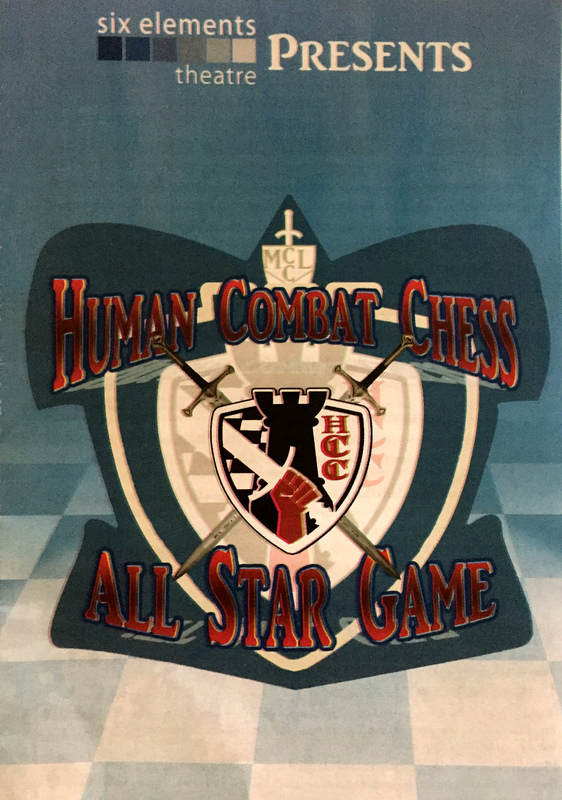 I had just heard of Human Combat Chess a few days prior, and the concept was new to me. But my children love the theater and my son plays a mean game of chess, so I figured this would be a fun event. I was not disappointed—and judging by the reaction from the stands, the rest of the crowd was not disappointed either. In short, this event is a must-see. Whether you are a sport fan, a theater fan, or an old-school chess fan, there is something in this production for you. Six Elements combines all of these elements plus humor, witty dialogue, and fun banter between players to give the show complete entertainment. Which team will win the best of three games? Gregory Parks (Team Roses), representing the black team, battles Talon Teasley (Team Dragons), representing the white team. This is not your ordinary theater, nor is it your typical sporting venue. The gym floor has a section roped off, and in the middle is a foam “stage” set up like a chess board. Spectator seating runs along the sides of this stage. There are also two large stands opposite each other that hold several weapons: long swords, small swords, broadswords, daggers, katanas, and some I had never heard of before. Next to them on the floor is a pile of shields in various sizes. The announcers sit on one end, and across from them is a projected screen that shows a chess board where you can watch the game played out. The players spend a few minutes warming up, and some appear to be going over strategies. Despite everything that is different, though, the atmosphere is not much different from mainstream sporting events. The little boys that seated next me were excitedly telling me about their dad being on the Celts team and how fun it was going to be to watch him fight. The volume inside was much louder than the usual murmur prior to any theater show I have previously attended. 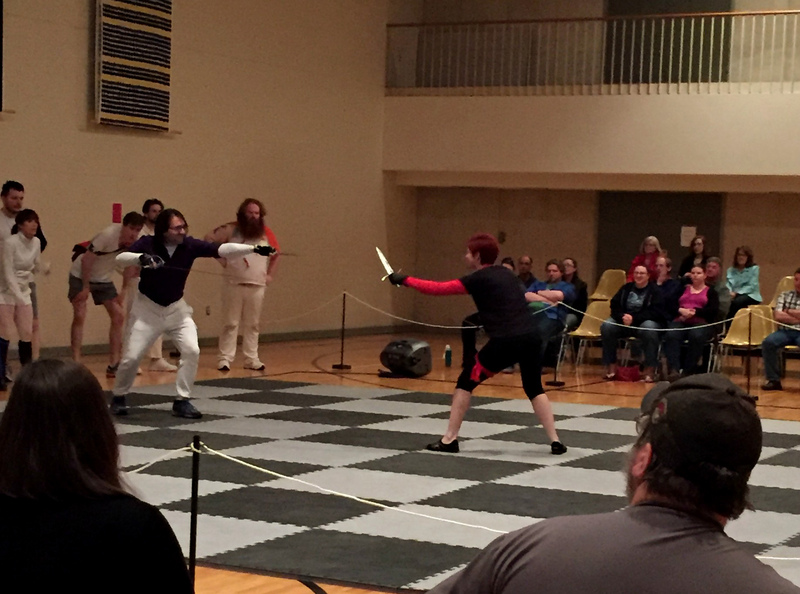 Brett Rogers (Team Roses), representing the white team, battles with the rapier and dagger against Kathryn Jacobs (Team Legion), representing the black team. The show starts with a brief introduction of the players and rules by announcers Skot Rieffer and Brian Watson-Jones, who have a delightful rapport. This being the All-Star Series, players from the normal eight teams are arranged into two teams. The marshal, Mike Lubke, who started the Midwest Combat Chess League, then directs players to “assume the board,” and the match begins. Players take the same positions as the game pieces of a typical chess game, and the kings—Noah Stein for the white team and Nathanial Nesheim-Case for the black team—call the moves. Play progresses according to standard chess rules until one piece moves to capture another, at which point the square becomes contested and the board is cleared. The two players dueling for the square battle until one yields, meaning they are placed in a disadvantageous or submissive position. The winning player then takes the square. The other players rejoin the board and play continues until another square is contested, the process continuing until one king is captured. Stein and Nesheim-Case are great in their take-charge roles. The duels are well choreographed, and the interaction between the players is entertaining. 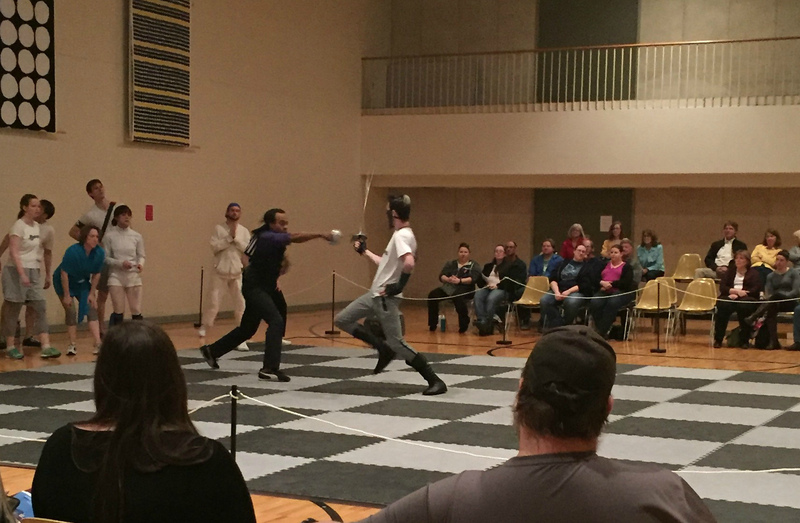 The audience at opening night was captivated, laughing, clapping, and cheering not only during the duels but also during the hilarious banter on the board. Every player seemed to have their own characteristics and back story that was told during a battle or in conversation between the announcers. Overall, whether you call it a show or a match, it is delightfully entertaining. One criticism on the entire show is that at times, it was difficult to hear what the announcers were saying with the audience and the players all cheering and speaking at the same time. It is understandable with the show being set as a sporting event, but it could cause the audience to miss important dialogue. 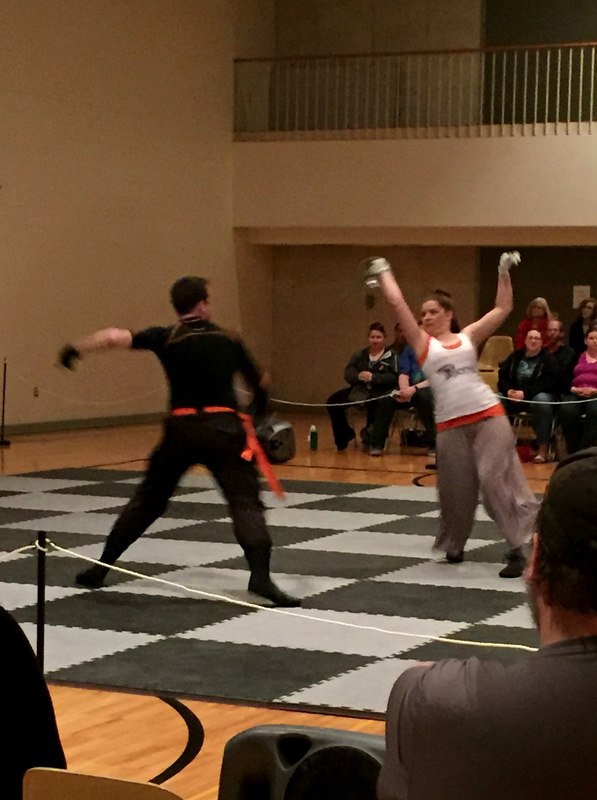 Phoenix teammates David Elwyn, representing the black team, and Jena Young, representing the white team, battle for a square using dueling sabers. According to Mike Lubke’s back story, the idea of the MCCL began when, while attending the University of Minnesota, he needed something for his senior project. He modernized the Renaissance-era game of human chess and created an underground sporting event. The project was a success, and a couple years later Lubke presented the idea of expanding the story line to Six Elements Theatre, which was started by a group of U of M graduates that included Lubke. Every year, the fictional backstories have been filled in and added to the real events that are played out in the show. These blurred lines between fact and fiction are just one of the many entertaining aspects that distinguish this show from any others you will attend. So, which team will win the All-Star Series? You will have to attend and find out for yourself. The shows continue May 5, 6, and 7, 2016, at Christ Church Lutheran in Minneapolis. For full details, visit the Six Elements Theatre website or Facebook page. Additionally, any Twin Cities Geek readers out there looking to get a head start on their stage combat skills should be aware of the Brawl of America, a workshop sanctioned by the Society of American Fight Directors taking place the last weekend of May. Classes are held in a variety of weapons and fighting styles for all levels of experience. Check their website for registration and details. The MCCL All-Star Game, April 29 through May 2 and May 5 through 7, 2016.